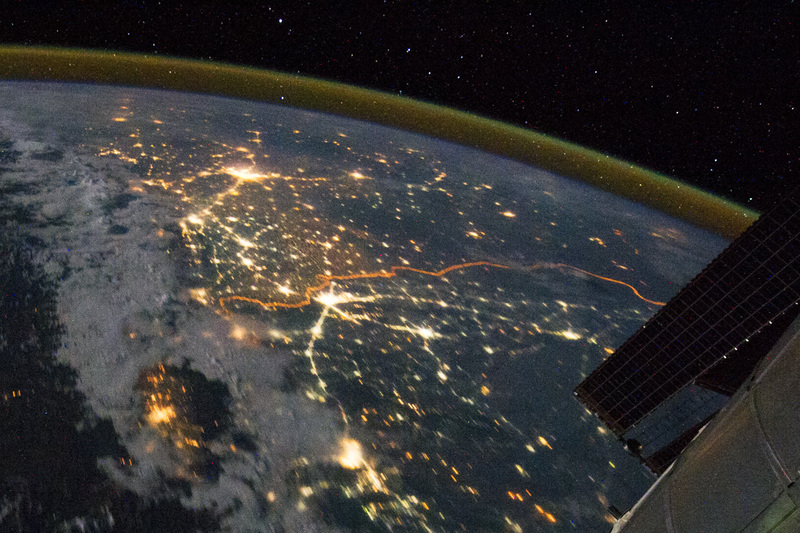 I find it a little funny that, while Republican candidate Rick Perry explains how a fence cannot be built on our southern border, NASA's Earth Observatory web site recently posted a night-time satellite image of the northern India-Pakistan border which clearly shows the floodlight-illuminated fence along the Line of Control (see below). The Pakistani government doesn't like India's barbed wire double fence, but the Indian military says it is very effective at keeping out militants. The barrier is not pretty from the ground, but it looks kind of nice from space. I figure that Rick Perry is trying to exact revenge on the uppity peasants after they contributed to the demise of his beloved Trans-Texas Corridor project, a 4,000-mile network of toll roads and rail lines for increasing global trade. "The fence is designed to discourage smuggling and arms trafficking."